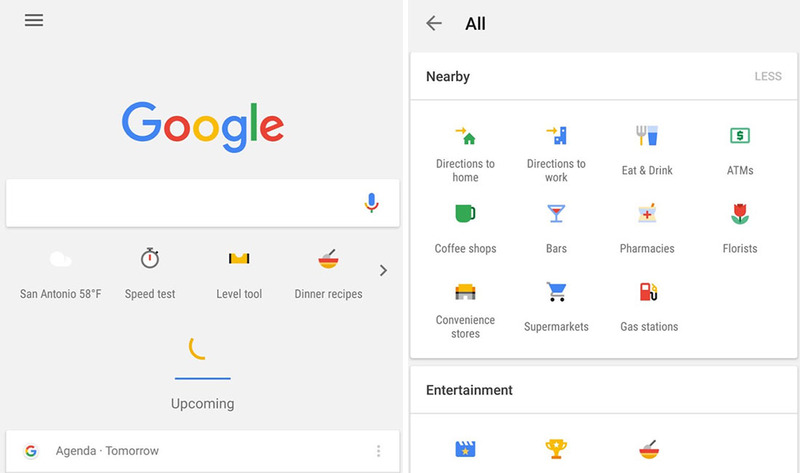 This morning, Google announced that Google Search will soon (starting today) begin showing shortcuts to some of its most popular tools. This is the broader rollout of a feature that has been in testing for some time. In fact, we showed you these shortcuts back in early February. The shortcuts, once they start showing on your device, will be found just under the search bar as you load up the Google app or swipe over into Google Now in the Now Launcher. You can see exactly what this looks like in the image above. From there, you can tap an arrow to get into the full list of shortcuts to tools. I don’t know for sure, but the arrangement of them at the top of the Google app should change as you use them or at least show those that you might want to use, rather than a random assortment of buttons. What are these shortcuts for? As I mentioned, they are shortcuts to some of Google Search’s most popular tools. Want to know when sunset is? Tap on the Sunset shortcut. Want to see sports scores? Tap the Sports shortcut. Want to find bars, pharmacies, florists, or ATMs nearby? Tap those shortcuts. You can even quickly launch into an internet speedtest, turn your phone into a level, and of course, get the weather. Be sure you have the latest version of the Google app in order to get access to shortcuts.